Nutri-Grain bars have long seemed to be an under appreciated breakfast food on the market. It seems to me that almost everyone has a box of them (or at least a generic version) in their pantry, but they serve primarily as a backup in case they're in a time crunch. Think about it... How many times have you thought to yourself: "I don't really have time to sit down for breakfast. I'll just have a cereal bar." Just a cereal bar? I don't think breakfast should ever be just breakfast. It should be a delicious jump-start to the day! 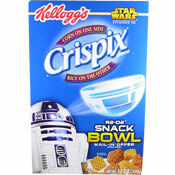 If the flavor is well-executed, even a seemingly boring cereal bar can accomplish that task. Keeping that in mind, how does the latest flavor of Nutri-Grain bars measure up? I decided to pick up a box of the new blackberry variety to find out. 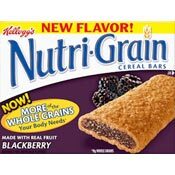 Since I have always enjoyed the flavor of blackberry, I was pretty excited when I first learned Nutri-Grain was going to add it to their line-up. With much anticipation, I opened one up, took a bite, and held it in my mouth as I waited for the blackberry flavor to emerge. Hmmm... Did I miss something? Where's the rush of blackberry goodness? Maybe I just didn't take a big enough bite. I bit off a larger chunk and waited again. Unfortunately, I still didn't get the flavor I was hoping for. There's not really anything distinctively blackberry about the filling of this bar. It tastes more like a subdued version of a blueberry Nutri-Grain bar, or maybe even mixed berry. Basically, if I were doing a blind taste-test, I'd probably just say it tasted like berries in general. I also noticed something a little off in the flavor of the outer layer of crust. At first I couldn't quite put my finger on it, but after inspecting the box, I realized the culprit. The package says "NOW! MORE of the WHOLE GRAINS your body needs." While I appreciate the fact that Kellogg's is making their products healthier, you can definitely detect the change here and it's not for the better. It seemed slightly harder and more crumbly than usual. If you like a drier consistency in your cereal bars, then you'll probably have no problem with it. However, if you prefer Nutri-Grain's original soft texture and buttery flavor like I do, then I guess we're both out of luck. Overall, I was somewhat disappointed by the newest addition to the Nutri-Grain line. They were okay, but they were nothing special. I love the flavor of blackberry, but Kellogg's just missed the mark with this bar. I would probably be more likely to choose another one of Nutri-Grain's offerings, such as strawberry or apple cinnamon, simply because they deliver the flavors they promise. So I suppose that at least in the case of blackberry Nutri-Grain bars, they will continue to live up to their reputation as a breakfast understudy. A huge thanks to Heather Hughes for sending in this review. Also check out Heather's review for Eggo BakeShop Swirlz - Strawberry. What do you think of Nutri-Grain Blackberry Cereal Bars? One - this is too small. Two - it crumbles in your hand as soon as you open the cover. Three - too much sugar and lot of unhealthy stuff. Just don't buy it. Yuck. I just paid 85 cents to get this out of our vending machine at work. The bar is way small. They should just call it a Fig Newton. Should've got a Snickers... d'oh!! Do they sell these in the United Kingdom? I had these on my bike a few weeks ago as a mid-ride snack. Pretty dry, the flavor definitely wasn't blackberry - we have blackberry bushes behind our house. I also agree that the ingredients aren't the most "wholesome." I don't know... Maybe I was craving my normal Clif Bar, but these just didn't cut it. Trigger -- Oooo...Blackberry Pop-Tarts sound fantastic! These were gross, and has way too many unhealthy ingredients that it negates the fact that it has "whole grains" in it. If you want a superior nutritional bar with only 2-5 all-natural raw ingredients, I'd suggest LaraBars. I eat one for a mid-afternoon snack every day. I love them. They were on sale at my store 2 for 4 dollars. I'm gonna go get more before the sale ends. I hope they come out with black berry pop tarts next.